Europe is a major manufacturing centre for us. Today we have nine manufacturing centres building cars, engines and transmissions across the continent, each one committed to delivering ever better cars for our customers. We have a workforce of more than 17,000 people dedicated to building not just the eight different models we manufacture in Europe, but also most of the engines and transmissions they use as well. Many drivers may not be aware of it, but there is every chance their Toyota was built in Europe. 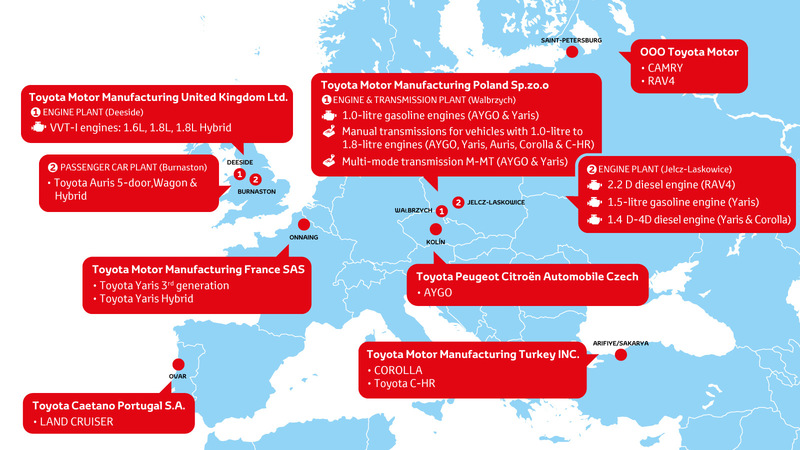 In fact, 8 out of 10 Toyota cars sold in Europe are built at one of our European production centres, too. We have six vehicle plants, located in France (Yaris), the UK (Auris), Turkey (Toyota C-HR and Corolla), the Czech Republic (Aygo), Russia (Camry and RAV4) and Portugal (Land Cruiser for export). We also have engine and transmission manufacturing facilities in Poland and the UK. Not only do these supply local markets, they also produce vehicles that are exported around the world. Toyota Motor Manufacturing France SAS in Onnaing. Toyota Motor Manufacturing United Kingdom Ltd. in Burnaston. Toyota Motor Manufacturing Turkey INC. in Arifiye/Sakarya. Toyota Peugeot Citroën Automobile Czech in Kolin. OOO Toyota Motor in Saint-Petersburg. Toyota Caetano Portugal S.A. in Ovar. Toyota Motor Manufacturing United Kingdom Ltd. in Deeside. Toyota Motor Manufacturing Poland Sp.zo.o in Walbrzych. We first began building cars in Europe on a relatively small scale in 1971. Since then we have invested more than €9 billion in our manufacturing operations here and celebrated their total production passing 10 million vehicles. The way we make vehicles is defined by the Toyota Production System (TPS). It is an original manufacturing philosophy that aims to eliminate waste and achieve the best possible efficiency – what is often called a “lean” or “just-in-time” system. We operate TPS throughout our business, including all our vehicle factories. You can find out more about how TPS works and its success here. Toyota Production System: Maximising production efficiency through the elimination of waste. We have long believed in the importance of making vehicles local to the markets where they will be sold – a business principle that has proved its value not just in Europe, but in many other world regions as well. By developing “local” manufacturing sites, we can better understand how our customers use their cars and what their priorities and preferences are when deciding which model to buy. This kind of knowledge is important in our mission to build ever-better cars. Local manufacturing also helps us deliver vehicles more quickly, reducing the time, cost and environmental impact of shipping cars around the world. European Production Philosophy, Made in Europe - For Europe : About 80% of all our sold vehicles are built in Europe. How different is our 3 millionth Yaris from our first? At first glance, it is easy to see the difference between the first Yaris we built in 2001 and the three millionth car that came of the production line at our Valenciennes factory in northern France in summer 2016. Going beyond simple appearance, much more has changed beneath the skin, however. Today’s Yaris has stronger environmental credentials, with the hybrid version cutting the level of CO2 emissions by half and achieving a 50% improvement in average fuel consumption, compared to the original 1.0-litre petrol supermini. This in spite of the fact the car is more powerful and heavier than before, being equipped with more safety systems and extra crash protection features. Hybrid aside, even the current 1.0-litre petrol model now produces less than 100g/km of CO2. There have been important changes in the way we build Yaris, too. Today we use 90% less water at Valenciennes than we did in 2001, and most of it is sourced from rainwater we collect on-site, or recycled waste water. We have also made sure that all the waste produced in the manufacturing process is recycled, re-used or recovered – nothing is sent to landfill. The Yaris is also more aerodynamic in shape, cutting through the air more cleanly, which contributes to its more efficient performance. How is your Toyota made? Have you ever wondered about how we build the cars you drive? Let us show you, using the example of our Burnaston factory in the UK where we make all the Auris models we sell in Europe. Welcome to Toyota Burnaston Plant. Our Auris story begins with huge, 45-tone rolls of steel. These are smoothed, cut into sheets, shaped and moulded in the press shop to form body panels that will be welded together to make up the car’s unpainted body shell. The presses exert enormous pressure and are the biggest machines in the factory, each as big as a house. Each shift at the factory will use around 300 tonnes of steel to build up to 750 cars a day – that’s one every 66 seconds. Once pressed, the panels are loaded in sequence on racks ready for the welding teams. Welding robots and stilled people assemble the bodyshell and create more complex parts, such as the doors. Here, as at every stage in the manufacturing process, thorough checks and inspections are made by both machines and humans. Body Shell ready for paint. Next stop is the spotless paint shop where each vehicle will be cleaned and given anti-corrosion coatings before the application of waterproof sealant and noise and vibration-damping material. Only then are the primer and top coats of paint applied, with heat treatment in an oven to achieve the required finish. Moving to the assembly shop, the painted bodyshell is fitted with all the parts needed to turn it into a fully functioning car, from wheels, engine and gearbox, to seats, steering wheel and safety equipment. The factory also has its own plastics shops, where it makes items such as bumpers and instrument panels. Last stage in the production journey is the quality assurance department, where a skilled team make more than 2,000 rigorous checks on every vehicle. Every part of the cabin and exterior is scrutinised, the engine is started and stopped six times, acceleration and braking are tested and the car passes through a torrent of water to ensure it is leak-free. It all ends after 825 processes with a further paint quality check, after which the car can begin its onward journey to the retailer’s showroom and its first owner. Toyota Olympic and Paralympic Partnership | Toyota Europe We’re incredibly proud to announce our partnership with the International Olympic Committee and the International Paralympic Committee until 2024. Recall As part of Toyota’s commitment to quality and safety, Toyota is expanding these recalls involving certain Takata airbag inflators in Toyota. At Toyota, the safety of our customers is our number one priority, which is why we continually monitor the performance of our vehicles through a number of sources. If we become aware of a certain component or aspect of our vehicles that doesn’t meet our strict standards we will take appropriate action, as we have done in this instance. Toyota Service Promise The Toyota Service Promise is to keep your Toyota a Toyota. Discover the ways we are committed to taking the best care of you and your Toyota. Toyota's Journey to Dakar 2017 Dakar’s back for its eighth successive year in South America, join the action and follow the Toyota teams' progress. Better Designed For You When you take to the road, it’s important to know that your Toyota is ready for anything that might come its way. Discover how Toyota’s innovative thinking and technology – from hydrogen fuel cells and THUMS family, to aerodynamics and extreme temperature tests – results in better, safer cars for everyone. Toyota make the podium at Dakar 2016 Relive the mud, sweat and cheers of Dakar 2016 as two Toyota teams raced towards the podium, finishing 3rd and 5th. Toyota's Journey to Dakar 2016 Dakar’s back for its eighth successive year in South America, join the action and follow the Toyota teams' progress. The Toyota Mirai: A start for the better Our world faces many challenges, with Mirai we are making a start for the better, to ensure that we can enjoy a future that cares about the environment.